This kit includes the Garmin Edge 520, Garmin Soft (ANT+) Heart Rate Strap, the Garmin Speed & Cadence Sensor, and the Extended Out-The-Front Mount that lets you put the 520 out in front of your stem where you can easily see it to collect speed and cadence data while using a trainer. The 520 features seamless Strava integration for segment alerts, live-tracking and instantaneous data. 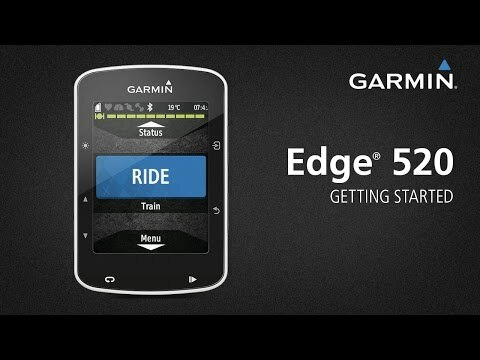 Newly features include a V02 max estimation tool, Bluetooth 4.0 integration and the ability to upload downloadable workouts or race courses via Garmin Connect. Classic features include ANT+ sensor support (power meters, cadence, speed, heartrate and more), an auto-scroll feature, up to 10 fields of data per screen and the uber-solid Garmin quarter mounting system. Whether training hard (there's a recovery tool for planning workouts), adventure-riding (detailed third-party maps are now downloadable) or attacking that next Strava KOM, the Edge 520 is an outstanding high-tech addition to your cockpit. GPS receives signals from US satellites and GLONASS network for fast, reliable acquisitions regardless of terrain or coverage. GPS records speed, distance, altitude, hill gradients, and tracked routes. ANT+ compatible for use with heartrate monitors, power meters, speed/cadence sensors, Garmin VIRB action cameras or scales. (Note: no sensors included). Bluetooth 4.0 compatibility transfers workout data with your phone – just to be clear, it works with Bluetooth 4.0 or newer. Program up to 10 fields per page across a maximum of 5 pages. Auto-scroll feature constantly keeps you up to date on every bit of data. Speed and Cadence Sensor attach with no magnets or exposed parts, making them easy to install, maintain and move between bikes. Speed Sensor attaches to a standard hub on either wheel and self-calibrates with the Edge 520 for accurate speed and distance. Soft (ANT+) chest strap sends reliable signal between the receiver and the watch. Optimized for use in congested areas like gym classes and start lines.